It’s time to reflect on the most futuristic breakthroughs and developments of the past year. This year’s crop features a slew of remarkable scientific and technological achievements, from an actual working hoverboard to cyborgized brains. Here are 18 predictions that finally came true in 2015. Artificial intelligence isn’t a threat at the moment, but that doesn’t mean we can’t start to prepare for the day when it becomes much more powerful—and dangerous. To help raise awareness and get the public thinking about the risks, a number of prominent thinkers and experts raised their voices this year. Several months later, the FLI issued another open letter, this one calling for an outright ban on AI weapons, or as they put it, “offensive autonomous weapons beyond meaningful human control.” Prominent signatories of the letter included Hawking, Musk, Steve Wozniak, Noam Chomsky, MIT physicist Max Tegmark, and Daniel C. Dennett. The concern is that AI weapons, once outside the “human loop,” could be difficult to control, and they might—either deliberately or accidentally—be turned against us. In October, experts warned a United Nations panel about the dangers of artificial superintelligence. The meeting featured two prominent experts, Tegmark and Oxford philosopher Nick Bostrom. The UN panel was told that artificial superintelligence has the potential to transform human society in profoundly positive ways, but they also raised questions about how the technology could quickly get out of control. We Finally Got a Working Hoverboard. Sort of. 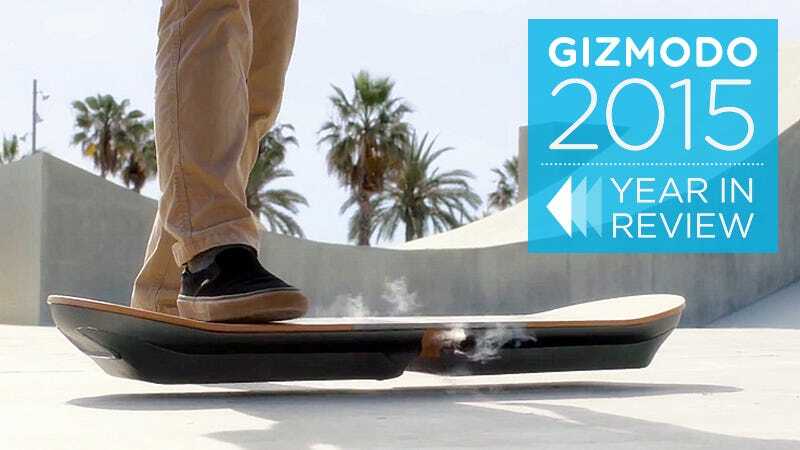 Back in June, Lexus put out a promo video showing what appeared to be a functioning hoverboard that actually floated about an inch of the ground. It even had steam coming off it. The company claims that its hoverboard, called SLIDE, uses liquid nitrogen-cooled superconductors and permanent magnets to support an actual rider, which explains the foggy mist. Gizmodo reached out to Lexus for more information, and the company admitted that teams from Germany and London have been working on the device for the past 18 months. Later, we learned that the board only works on a special metallic surface, and not the concrete surface shown in the video. So it’s a bit of a tease—but one that appears to hold some promise. In an advance that will eventually lead to technologically-enabled telepathy, researchers at the University of Washington’s Institute for Learning & Brain Sciences developed a system that enabled a pair of participants to play a question-and-answer game (similar to 20 questions) by transmitting signals from one brain to the another over the Internet. Remarkably, the system was completely non-invasive, leveraging an EEG device, transcranial magnetic stimulation (TMS), and a computer for processing and translation. By mentally transmitting “yes” and “no” responses, paired participants were able to guess the correct object, like a dog, even though they were almost a mile apart. In January, a two-year-old Thai girl named Matheryn Naovaratpong became the youngest person to undergo cryopreservation. The case showed how cryonics—the practice of preserving a body in a vat of liquid nitrogen in hopes of being brought back to life in the future—is gradually making its way into the mainstream. But it also showed the desperate attempts that some parents will go to when facing the loss of a young child. Matheryn was diagnosed with a rare form of pediatric brain cancer (ependymoblastoma). Her parents, both with doctorates in engineering, went to great lengths to find an effective treatment, and tried aggressive chemotherapy, high dose radiation therapy, and numerous neurosurgeries, but Matheryn’s health was failing. When it became clear that Matheryn had only months or weeks left, given today’s level of medical science and treatment, the parents completed cryonics arrangements for her and worked with Alcor...to overcome barriers of distance to provide her with a high-quality cryopreservation – which includes cryoprotection of her brain. For the first time ever, a transhumanist is making a bid for the White House. Author, philosopher, and futurist Zoltan Istvan is campaigning on a platform that openly advocates for the development of human enhancement technologies and extreme life extension. He believes that technologies can and should be used to augment human intellectual, physical, and psychological capacities, and that death is something that should be obliterated. To that end, Istvan has been campaigning in an old school bus that has been reconstituted to look like a coffin on wheels. But not all transhumanists want a ride on the “Immortality Bus.” He has been disowned by many key transhumanist thinkers, and has alienated self-avowed transhumanist groups. Critics complain that Istvan’s positions and actions aren’t consistent with the Transhumanist Declaration, and that his one-man Transhumanist Party is an opportunistic attention-grabber that’s sending the wrong message. A volunteer firefighter from Mississippi became the recipient of the world’s most extensive face transplant. Patrick Hardison, 41, now bears the face of a 26-year-old man who died in a tragic cycling accident. The $1 million procedure, which was performed by a 150-person medical team from New York University Langone Medical Center, took 26 hours to complete. Hardison received a full scalp and face, including ears, nose, lips, and lower eyelids. Yamaha unveiled a robotic biker called the Motobot that can handle some of the fastest motorcycles on Earth. The company’s robotics division hopes to refine the sleek android so that it can handle an unmodified motorcycle, i.e. no added safety gear, to speeds of more than 120 mph (200 km/h). The Arctic Svalbard Seed Vault currently safeguards the seeds of 820,619 plants in the event of massive environmental catastrophe, disease, nuclear war, or an asteroid impact. It’s an insurance plan for the future, but sadly, it appears the future has arrived earlier than expected. The ongoing civil war in Syria has prompted the first-ever withdrawal of its precious contents, specifically samples of wheat, barley, and grasses suited to dry regions. Researchers in the Middle East were forced to make the withdrawal after a gene bank near the city of Aleppo was damaged in the war. Roboticists at the Rensselaer Polytechnic Institute’s Artificial Intelligence and Reasoning Lab adapted three old NOA robots to see if they could pass a simple reasoning test indicative of self-awareness. Inspired by the King’s Wise Men Test, all but one of the three robots were administered “dumbing pills” that made them unable to speak. The challenge was for the robots to determine which one was given the placebo, and thus still able to speak. The one given the placebo ultimately spoke and said “I don’t know” when asked the question—at which point it “realized” that it must have been given the placebo. After hearing its own voice, it stated: “Sorry, I now know!” It’s an example of self-awareness, albeit in very basic form. The achievement is nothing to get too excited or alarmed about, but it shows how a simulation (as opposed to an actual emulation) of AI self-awareness can be programmed into our technologies. One-year-old Layla Richards from London, England, became the first patient in the world to receive a pioneering gene-therapy, performed by Great Ormond Street hospital doctors. The girl was diagnosed with incurable aggressive leukemia, but she’s now in remission after receiving “designer cells” from a donor. The therapy made use of a powerful new gene-editing technique that could eventually be used to treat an array of hereditary diseases. On the topic of gene-editing, researchers in China genetically modified human embryos. It was a watershed moment in biotech history, an achievement that made our list of top science stories of 2015. The advance, while controversial, could lead to so-called designer babies. Japanese firm Hitachi is now using artificially intelligent managers that can not only issue workflows and employee duties in realtime, but can also find ways to improve employee efficiency. In one case, an AI was put in charge of a warehouse management system, and it improved efficiency by 8 percent. In related news, China’s manufacturers are shifting towards “zero-labor” factories, which will be completely run by robots. The automation revolution is at hand. Researchers from École polytechnique fédérale de Lausanne (EPFL) managed to restore the walking ability of paralyzed rats by implanting soft and flexible neural implants directly onto their spinal cord. The technology, called e-Dura, utilizes both chemical and electrical stimulation, and does not cause inflammation. It could eventually be used on humans, but the technique would require a suite of multifunctional implants installed over the course of long periods. By learning everything there is to know about you and your online habits, a startup called ETER9 promises a kind of digital immortality wherein an artificially intelligent agent continues to post to the social network on your behalf when you’re away from the computer, or theoretically, long after you’re dead. It’s still in the beta phase, but 5,000 people have already signed up. To make it work, users “externalize” themselves, making it possible to maintain “connections” at any time. Digital versions of users can remain active even when the organic user is offline, performing such tasks as posting content, commenting, or clicking a “smile” button. Harvard scientists developed an electrical scaffold that can be injected directly into the brains of mice with a syringe. By cyborgizing the brains of mice with a soft, conductive polymer mesh, the researchers can leverage the technology to perform a number of tasks, such as monitoring brain activity and stimulating brain functions. In future, a refined version of the device could be used to treat Parkinson’s, among other cognitive disorders. Sounds crazy, but researchers from New Zealand’s Touchpoint Group are using machine learning to help its AI system recognize—and even simulate—anger. The idea is to help companies deal with common customer complaints. Called Radiant, the system will eventually be able to generate over a hundred million angry interactions. Touchpoint is hoping to build a system that can autonomously find the best response to typical customer complaints. It will be a long time before we see artificial skin that feels and reacts like the real thing, but researchers from Stanford University took us a major step in that direction. Their stretchable artificial skin, called DiTact, is equipped with mechanoreceptors that can sense the force of static objects. Remarkably, the scientists were able to transmit incoming sensory data to the cultured brain cells of mice. The ultimate goal of the project is to imbue human prostheses with touch-sensitive artificial skin. What could be more futuristic than the international community coming together and finally doing something meaningful—or at least potentially meaningful—about the ongoing climate change crisis? Let’s hope the Paris Accord will set us on a path where we’ll actually be able to create the future of our dreams.